The term sutra is reserved for a sermon of Gautama Buddha or one of the great Bodhisattvas, and the canon of the Ch'an school, the Tripitaka, contains only one Chinese work bearing that title: The Sutra Spoken by the Sixth Patriarch on the High Seat of the Treasure of the Law, otherwise known as The Platform Sutra of Hui-neng. Thus it's reasonable to conclude that Hui-neng (638-713 AD; Wade-Giles: Dajian Huineng; Pinyan: Huìnéng; pronounced wee neng or nong; sometimes written as Wei Lang, which would be pronounced way long; Daikan Yeno or Eno in Japan; Hyeneung in Korea) was considered by succeeding generations of his countrymen as the greatest of the Ch'an Masters. Learned Audience, our essence of mind [literally, self-nature], which is the seed or kernel of enlightenment [bodhi], is pure by nature, and by making use of this mind alone, we can reach buddhahood directly. Now let me tell you something about my own life and how I came into possession of the esoteric teaching of the Dhyana school. His story is fascinating reading, starting with a brief reference to his father's dismissal from an official post and early death, which left Hui-neng and his mother in dire poverty. Selling firewood to survive, he one day heard a man reciting a sutra, whereupon his mind at once became enlightened. This may seem far-fetched, but the twentieth century Hindu sage Ramana Maharshi said that there are two kinds of ignorance: forgetfulness of the Self, and obstruction to the knowledge of the Self. The first kind only needs to hear the Truth one time in order to be dispelled, while the more common kind needs to have the Truth repeated over and over until doubt and wrong identity are dispelled. He asked the man what he was reciting, and the man told him it was the Diamond Sutra (Vajrachchedika, or Diamond Cutter) and that he had come from a visit to the monastery of Hung-jen, the fifth patriarch of the dhyana school, where there were about one thousand disciples. Hui-neng attributed his having heard the man to good karma, which further led to his receiving a gift for the maintenance of his mother by a man who recommended that he pay a visit to the patriarch. In his first interview with Hung-jen, the master apparently recognized his condition and assigned him to keep a low profile to avoid coming to harm at the hands of jealous followers. So Hui-neng spent the next eight months chopping firewood and pounding rice. Then one day the master stopped by the kitchen and told him in a roundabout way to meet him that night, at which time Hung-jen expounded the Diamond Sutra to him. Hui-neng said that when he heard the sentence "One should use one's mind in such a way that it will be free from any attachment," he "at once became thoroughly enlightened and realized that all things in the universe are the essence of mind itself." His description seems to contradict his statement of becoming enlightened upon first hearing the Diamond Sutra, but in any case he said that "the dharma [Truth in its aspect of the way, teaching, or law] was transmitted" to him that night and that consequently he "became the inheritor of the teaching of the Sudden school," being named the sixth patriarch by Hung-jen. This occurred in 661, when Hui-neng was barely twenty-three. Hung-jen also told him that his life was now in danger and advised him to leave that part of the country. He did so and spent the next fifteen years living with a group of hunters. In 676 he decided it was time for him to begin teaching, so he went to a temple in Canton where he was asked to speak. The entire Platform Sutra is less than a hundred pages long and is tremendously inspiring, so I hope the inclusion of some of my favorite passages below (from the translation by A.F. Price and Wong Mou-lam; see the Sources & Links page) won't spoil the treat. The wisdom of enlightenment [bodhiprajna] is inherent in every one of us. It is because of the delusion under which our mind works that we fail to realize it ourselves, and that we have to seek the advice and guidance of enlightened ones before we can know our own essence of mind.... Those who recite the word prajna the whole day long do not seem to know that prajna is inherent in their own nature. But mere talking about food will not appease hunger, and this is exactly the case with these people.... Talking alone will not enable us to realize the essence of mind, and it serves no purpose in the end.... What we have to do is to put it into practice with our mind. What I can tell you is not esoteric. If you turn your light inwardly, you will find what is esoteric within. To meditate means to realize inwardly the imperturbability of the essence of mind. Those who train themselves for imperturbability should, in their contacts with all types of men, ignore the faults of others. The dharma doesn't wait for you. Vehicle [yana; implies motion] means practice; it is nothing that can be discussed but is something that you yourself must do. Exert yourself in order to see face-to-face the essence of mind, and relax not, for death may come suddenly and put an abrupt end to your earthly existence. Buddha delivered the Diamond Sutra for the very wise and quick-witted. 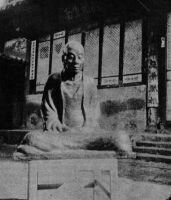 When Mahayanists [followers of the teaching Bodhidharma brought to China] hear about the Diamond Sutra their minds become enlightened; they know that prajna is immanent in their essence of mind and that they need not rely on scriptural authority, since they can make use of their own wisdom by constant practice of contemplation [dhyana]. I found this picture on Bob's Asian Art Gallery and wrote to Bob inquiring about it. He responded as follows: "We are an affiliate of the Guangzhou University of Chinese Medicine. For fifteen years we have taken interns to work in the hospital in Guangzhou. 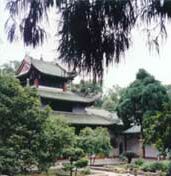 As you know Hui Neng was abbot of a large monastery in this same city [formerly known as Canton]. The monastery is still there and has recently been restored and new, young monks ordained. There are large murals of Hui Neng's life story on a number of walls. The temple has a Buddhist arts and crafts workshop where both small and very large Buddhas and other religious icons are carved for temples around the world. They also have scroll paintings done by artists who support the temple. The picture of Hui Neng... is a scroll I bought at the temple a number of years ago. 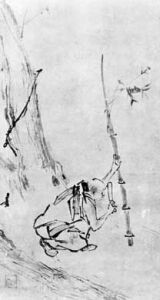 I feel certain that it is a good representation of Hui Neng because the scroll was done by an older painter with a long affiliation with the temple. The title 'Hui Neng frees the fish' is when monks would go to small ponds that would dry during a drought, scoop up fish, bring them to the river and let them out...."
Many thanks to Bob for his generosity and friendship to a stranger. Since Bob's explanation, I've read that the abbey in Shrewsbury, England, on the bank of the Severn River, in medieval times had fish ponds formed by diverting a stream through their property. So I'm guessing that scooping fish out during droughts and dumping them in the nearby river may not have been unique to the Nan-hua monastery. If there were no human beings, there would be no dharmas; hence we know that all dharmas are made for men, and all the sutras owe their existence to the preachers.... Through this the ignorant may attain sudden enlightenment, and their minds thereby become illuminated. Then they are no longer different from the wise men.... Without enlightenment there would be no difference between a buddha and other living beings.... Since all dharmas are immanent in our mind there is no reason why we should not realize intuitively the real nature of tathata [suchness, essence of mind]. Should we introspect our mind with real prajna, all erroneous views would be vanquished in a moment, and as soon as we know the essence of mind we arrive immediately at the buddha stage. We can hardly classify the dharmas into "sudden" and "gradual"; but some men will attain enlightenment much quicker than others. [Commenting on discernment, one of the four prajnas mentioned in the Lankavatara sutra:] The all-discerning wisdom sees things intuitively, without going through the process of reasoning. Being infatuated by sense objects, and thereby shutting themselves off from their own light, all sentient beings, tormented by outer circumstances and inner vexations, act voluntarily as slaves to their own desires. It is because of the delusion under which our minds work that we fail to realize [the wisdom of enlightenment] ourselves. Within our impure mind the pure one is to be found, and once our mind is set right, we are free from the three kinds of beclouding [hatred, lust and illusion]. If we are treading on the path of enlightenment we need not be worried by stumbling blocks. Provided we keep a constant eye on our own faults we cannot go astray from the right path. Erroneous views keep us in defilement while right views remove us from it, but when we are in a position to discard both of them we are then absolutely pure. Our physical body may be likened to an inn [that is, a temporary abode], so we cannot take refuge there. Because the mind of an ordinary man labors under delusions, he knows not his own inner nature. He who wishes to attain the all-knowing knowledge of a buddha should know the samadhi [our natural state] of specific object and the samadhi of specific mode. The samadhi of specific object: In all circumstances we should free ourselves from attachment to objects, and our attitude toward them should be neutral and indifferent. Let neither success nor failure, neither profit nor loss, worry us. Let us be calm and serene, modest and accommodating, simple and dispassionate. The samadhi of specific mode: On all occasions, whether we are standing, walking, sitting or reclining, let us be absolutely straightforward. All wisdom [prajna] comes from the essence of mind and not from an exterior source. Have no mistaken notion about this. This is called self-use of the true nature. Once the tathata is known, one will be free from delusion forever. Whenever a man puts a question to you, answer him in antonyms, so that a pair of opposites will be formed, such as coming and going. When the independence of the two is entirely done away with there would be, in the absolute sense, neither coming nor going. Within our mind there is a buddha, and that buddha within is the real Buddha. What you should do is to know your own mind and realize your own buddha-nature, which neither rests nor moves, neither becomes nor ceases to be, neither comes nor goes, neither affirms nor denies, neither stays nor departs. The dharma is nondual, and so is the mind. The path is pure and above all forms. I warn you not to use those exercises for meditation on quietude or for keeping the mind a blank. The mind is by nature pure, so there is nothing for us to crave for or give up. Do your best, each of you, and go wherever circumstances lead.